Elton John to Congress: You have "the power to end AIDS"
WASHINGTON, D.C. --Sir Elton John pushed the U.S. Congress to do more to fight the HIV/AIDS epidemic on Wednesday, praising lawmakers' past efforts to curb the spread of the virus and urging them to seize the opportunity to eradicate it for good. 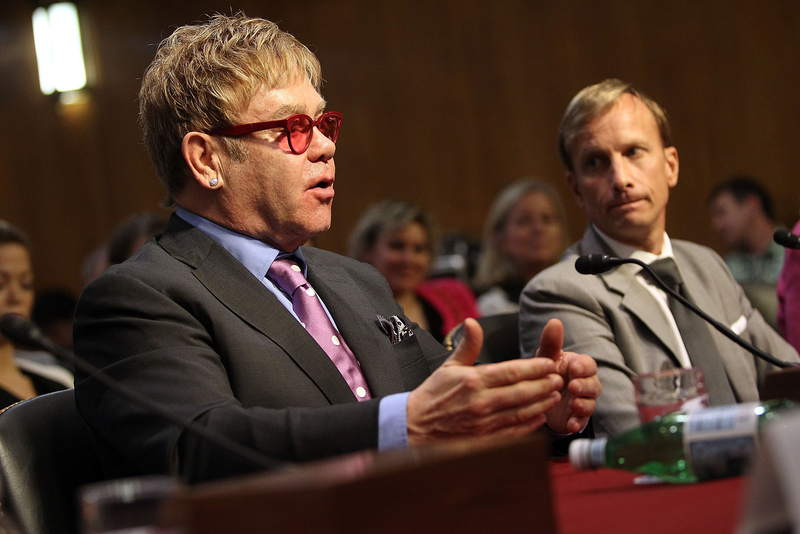 Elton John: U.S. Congress "has the power to end AIDS"
"This is the most powerful legislative body in the world. This Congress indeed has the power to end AIDS. I am asking you to use that power, to seize this window of opportunity, to change the course of history," John said during testimony before a Senate Appropriations subcommittee. "There is a window of opportunity before us -- a window through which we can very clearly see the end of AIDS -- within my lifetime. We cannot afford to let that window close." He lauded former President George W. Bush and Congress for passing the President's Emergency Plan For AIDS Relief, or PEPFAR, in 2003, crediting that measure with helping curb the spread of the virus around the world. "Compassionate leaders from both sides of the aisle said to the international community that America can, and America will, lead the global fight against AIDS," he said. "Because of this Congress, the course of the AIDS epidemic was altered for all of humanity." John is primarily known for his music, of course. But he earned the title "Sir" through his activism -- he was knighted by the British crown in 1998 due to the work of the Elton John AIDS Foundation, which has raised millions to halt the spread of the virus and seek a cure. His testimony was laced with personal moments, including a recollection of how a young HIV/AIDS activist, Ryan White, prompted his own attention to the issue. "I was a drug addict. I was a self-obsessed a**hole," John said. "Ryan White and his wonderful family turned my life around." When Sen. Lindsey Graham, R-South Carolina, asked him what he sees as the biggest impediment to progress in halting the spread of HIV, John immediately named the "stigma" surrounding the disease. "We are seeing, especially in African countries, the LGBT community suffering under draconian laws," he explained. "When people like that who are suffering from HIV are penalized, they go underground, and the disease is spread even further ... getting people to feel unashamed, they're ok with this virus -- and not to feel as if they're being threatened by their own governments because they may have a sexual orientation the leader of the government doesn't approve of -- is incredibly important. "Nobody should be left behind. We live in a world which is so materialistic, so narcissistic. The world needs compassion, the world needs leaders to show compassion. The current Pope is someone I revere very much because he's beginning to show so much more compassion, in a human way, than his two predecessors did," John continued. "This is vital to the recovery of ... self worth in this world. if people are told they're worthless, and they're unloved, then where are we as human beings? If Christ was alive today, and I believe in Christ, he would be appalled at the way people are being stigmatized."